No good deed goes unpunished; or, in my case, no attempt to craft a timely, seasonal post–this one for Valentine’s Day–goes un-disastrously. I’m not usually that kind of blogger, but this time around I thought, “Well, why not have a beautiful, chocolatey Valentine’s Day-oriented dessert on my blog for Monday morning? What harm could that cause?” Clearly: lots of harm. The good news is that I still have a post to share. The bad news is that my original post went so hilariously wrong, you won’t get the full experience I was aiming for. That full experience was supposed to be chocolate mousse in chocolate cups with a crunchy chocolate topping. You’re still going to get the chocolate mousse and the crunchy chocolate topping, you’re just not going to get the chocolate cups. The recipe I was using, which comes from one of my favorite chefs, Michel Richard, made so much sense to me I couldn’t wait to try it. 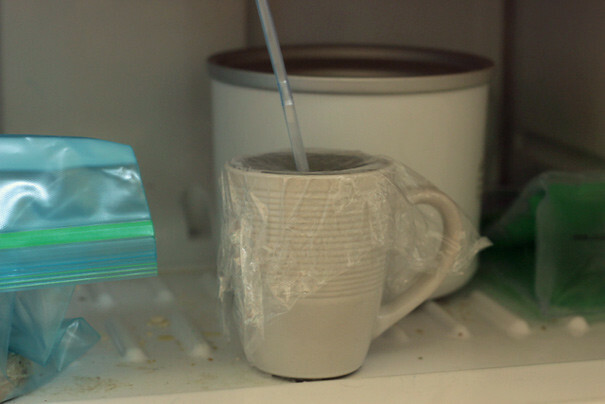 You take a mug, fill it with water, put plastic wrap on top, pop a straw or a stick in the center and freeze it. Then, when it’s time to make chocolate cups, you chop up good bittersweet chocolate (I used Ghiardelli, about 3 full bars; $12 worth) and melt it. Chef Richard says do it in a microwave. 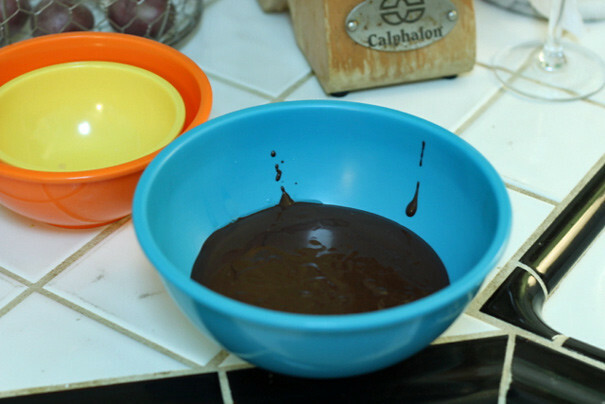 I don’t have a microwave, so I used a double boiler and then transferred the chocolate to a smaller bowl for the next step. 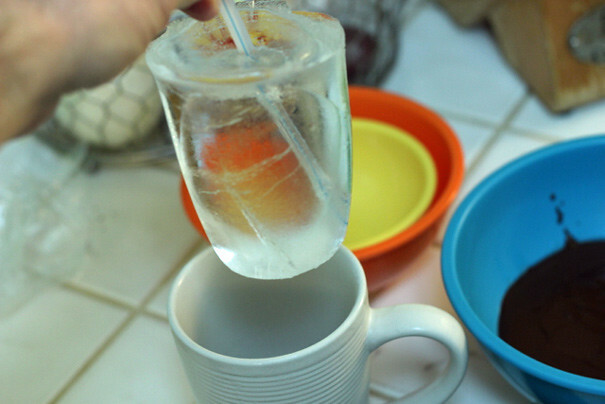 Here’s the next step: you pull the frozen mug-shaped ice out by the straw. You’re supposed to pull it out immediately and peel off a lovely chocolate cup. Now this first time around, my failure was entirely YOUR fault. Because I felt like I had to have a picture for you, I stopped when the frozen mugsicle went into the chocolate and took that picture. 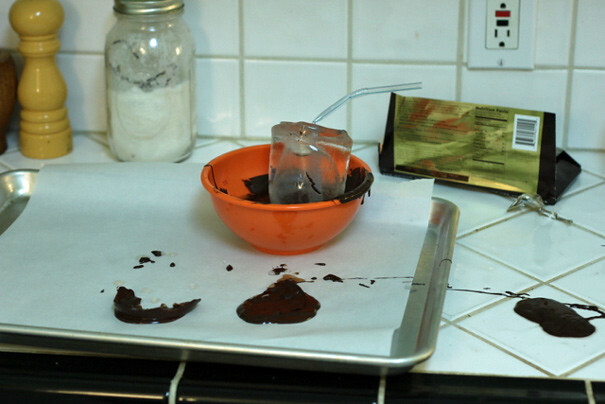 The result is that the chocolate practically seized up, the ice came out without any chocolate on it, and I’d wasted $12. I’m sending you a bill. Convinced that if I hadn’t taken that picture, it would’ve been successful, I chopped up another $12 worth of chocolate and tried the whole thing again. 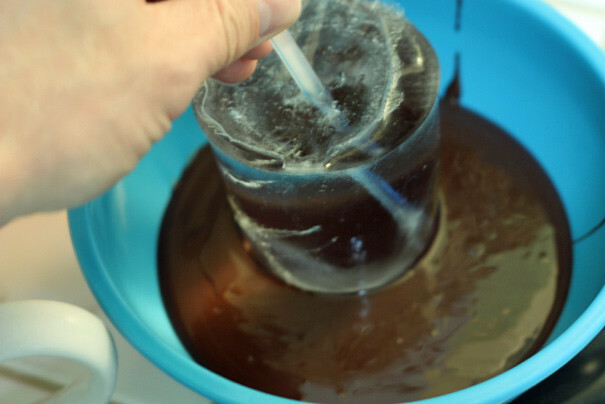 This time, I dipped the ice into the hot chocolate and immediately pulled it out. Nothing stuck. The chocolate got cold and wet. I made a few more half-hearted attempts, but nothing. I’d wasted $24 and, more importantly, lots of delicious chocolate (don’t worry: I did a lot of licking up of wet, icy chocolate, but still). Then, like salt on a wound, Smitten Kitchen comes along the next morning and posts the most fabulous, decadent, oozy salted caramel HEART-SHAPED brownies on her site. I buried my head in my hands and almost considered breaking out that old law degree, giving up my career as a professional food blogger. But yesterday I mustered up the energy to make the recipe without the chocolate cups. You’re about to see the results in the next post. But as for making chocolate cups? Unless you’ve got a better technique, my advice is: skip ’em.